I have been a stall holder the Sunday Craft Market at Williamstown and Hawthorn, Victoria alsmost 3 years. On one particular Sunday I placed a red heart shaped box along with pencil and paper on my stand. I asked the people who come to my stand to write down '' What is Love " for them. I collected their messages, and recreated their thoughts on to my small ceramics hearts. 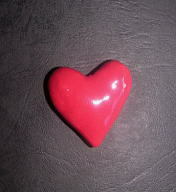 These hearts were then shared with others at the next Sunday Market. This become my small LOVE project that I 'd hoped would connect people through mutual feelings.